Will is a loser; his writing career was a non-starter and his wife left him. But this story isn’t about these things; it’s about the advancing kidney disease of both of the twin daughters his wife left him with, and Will’s efforts to save them. Fitzgerald creates a small unit of exquisitely flawed characters who, despite their disparities, are impossible to not empathise with. At times outright hilarious, this book entertains and enthrals the reader whilst focusing intensely on the disquietingly identifiable people within it. You will certainly end up rooting, along with Will, for a seemingly impossible happy ending. I’d like to start a blog so I can share my own experience and thoughts online. Please let me know if you have any kind of recommendations or tips for brand new aspiring blog owners. Appreciate it! Hi, thanks for your comment. I would recommend keeping posts short and snappy (which is sort of the point of BBB), and posting at least once a month (to keep followers engaged) and not more than once a week (no-one wants to be overloaded with post notifications). Try to find a niche so that you stand out from the crowd. Good luck with your blog! manually code with HTML. I’m starting a blog soon but have no coding know-how so I wanted to get advice from someone with experience. Any help would be enormously appreciated! Thanks for visiting BooksBeccaBuys! If you sign up to a website like worpress or blog spot, you can select from a range of ready made themes, which do all of the coding work for you. I don’t have to code and HTML for my blog. 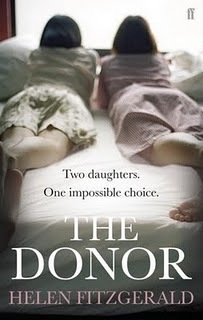 You are currently reading The Donor by Helen Fitzgerald (Book Review) at booksbeccabuys.